Khushboo Sharma, Mumbai was started by Khushboo Sharma who is the winner of Miss Maharashtra Beautiful Walk 2011. Since Last 5 years, she has been working as an Anchor, Host, Model and Entertainer in the industry. 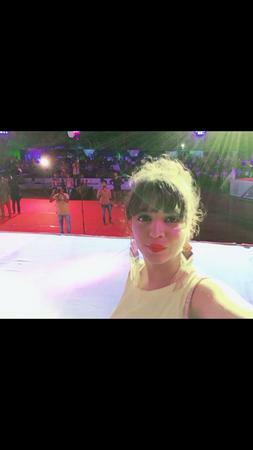 She is one of the leading Emcee/Anchor of Nation, who has hosted Many Corporate and Private Events. With prestigious clients list like BMW, BATA, CHICCO, GIONEE, HDFC, NISSAN-MOTORS, STANDARD CHARTED, TRIUMPH, TATA, VESPA, and many more. Khushboo Sharma, Mumbai makes your event memorable with Glamours and Beautiful Anchor Khushboo Sharma. Khushboo Sharma is a anchor based out of Mumbai . Khushboo Sharma's telephone number is 76-66-77-88-99, Facebook page is Khushboo Sharma and address is Mumbai-56. In terms of pricing Khushboo Sharma offers various packages starting at Rs 35000/-. There are 0 albums here at Weddingz -- suggest you have a look. Call weddingz.in to book Khushboo Sharma at guaranteed prices and with peace of mind.